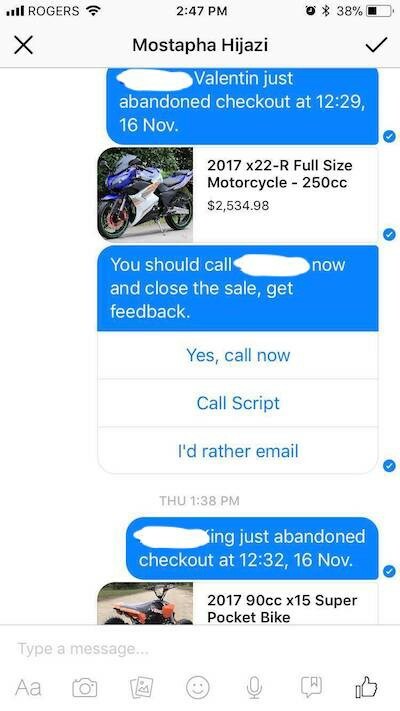 Venom Motorsports, a private labeled motorsport bike store based in Ottawa, Canada, has been using Scout for over a year, and was in fact one of the first 5 Shopify stores to install the Scout app. It was started in 2012 by Mostapha Hijazi out of his mom’s garage and has grown into a $1M+ per year brand. The following is an email interview with Mostapha Hijazi around topics of how he started, manages and grew his store. Scout: Thanks for taking the time to answer these questions. I know you’re a busy guy and we appreciate your time to help us and our ecomm audience learn. Just to start, so that our readers understand the scale of Venom Motorsports, what’s been the approximate monthly revenue or monthly orders you get. Mostapha: Not a problem, happy to help. Revenue wise in the last 30 days we’ve done US$135,000 in sales, and over the last 90 days we’ve done around US$350,000. S: Which ecommerce platform do you sell on and why? M: Shopify because they make it easy and I really like the “Cha-ching” sound the app makes when I make a sale. S: Why did you start Venom Motorsports? Where did you get the idea to sell motorsports products? M: When I was 13 I had bought a gas pocket bike off eBay from the US. After getting it and riding it for a week the police showed up to my house saying I cant ride it and fined us. My mom was so scared she made me sell it, so I put it up on Kijiji, which is like the Craigslist of Canada, and sold it for $50 more then I bought it for. At 13 that was a lot of money considering it was used, so I wondered how much I could make if I sold it as a new product and from there I ordered a few more from the US and eventually went right to the manufacturer in China, and soon ordering containers of them. S: When you first launched Venom Motorsports, did you have an audience to sell to right away or did you build your audience as you went? How have you continued to build your customer base over the 5 years you’ve been in business? M: We built our audience. When I first started I was only selling locally on Kijiji. Then I expanded on to eBay and eventually our Shopify store. There was an audience out there looking for bikes like ours so we just had to make sure we got to them. What really made my business take off was a YouTuber. He made tons of pocket bike videos and had a huge share of potential customers who wanted bikes but he would talk about how he was having a hard time finding where to buy them. So I sent him a free bike to advertise us and that took our website from having 40 views per day to over 400 per day. We also build and acquire customers through our Facebook page and advertising videos of our bikes. 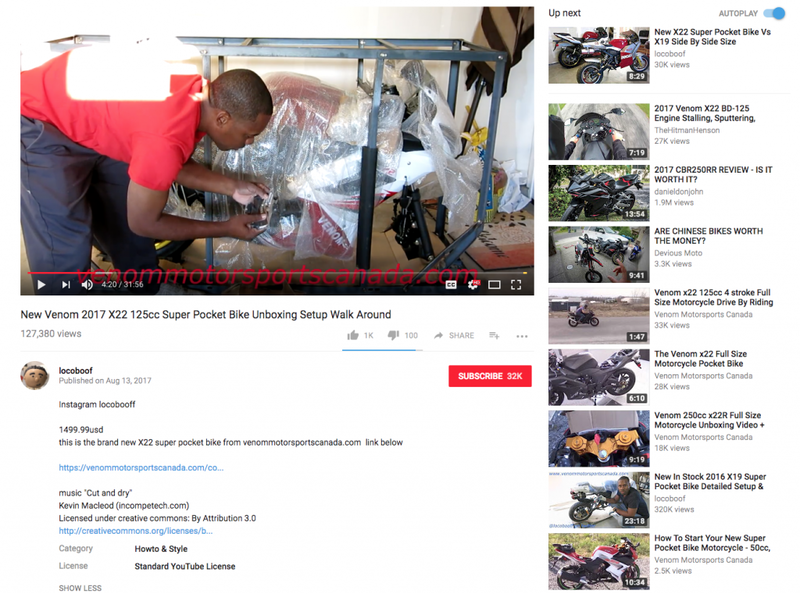 We also generate new content every month for other blogs about our bikes that helps us drive clients as well as our own YouTube channel showing you how to maintain and fix bikes. S: How have you approached your marketing strategy? How does your aim to provide excellent customer service play into your marketing strategy? M: Yes 100%. Without excellent customer service your business is nothing. Nowadays with the internet, bad reviews can break you even if you have an excellent product. If customers don’t have someone to talk to when they need to after-sale, your business wont go anywhere. So hire someone to manage that and promote the good reviews you get from it. S: The motorsports market is fairly saturated with other brand name businesses, how do you make your products stand out in the market? How do you differentiate yourself from your competitors? M: The motorsport market is saturated with big brand name companies like Honda and Yamaha and they also mainly offer bigger sized bikes like 500cc-1000c and their prices are really high even for their smaller bikes. So Venom comes in as the alternative brand that’s more then 50% cheaper than the leading international brands. And what’s nice is people give us a shot because they see these bikes are beginner bikes, bikes they will outgrow in a few years so why spend $6,000 on a brand name bike when they can spend $1500 on ours and get the same experience and training without the huge upfront costs. Also our bikes don’t weigh near the same as the leading brands. Imagine first time riding a bike and you get to a red light. The Hondas are very heavy making it hard to balance and ride for beginners so our bikes help in that way as well. S: Which marketing channels do you find the most lucrative (your own social media, working with influencers, email marketing, referral marketing, paid advertising, etc.)? M: For us its influencers and paid advertising and also blogs and forums. S: How did you make your first 10 sales? Your first 100 sales? M: Our first 10 sales were using eBay listings. Reaching 100 sales was via eBay, Kijiji and our own Shopify website. S: You sell both directly to consumers as well as wholesale to other businesses. How have you balanced serving both markets, have there been any unique challenges involved? M: Wholesale is fairly new to us. It was only in 2017 where wholesale took off for us. To balance it I made a separate wholesale department where I had my cousin manage it. He would go out looking for stores and answer the wholesale deals. Major challenge is we offer free shipping and the wholesale clients not only want a big discount on the bikes but also still want the free shipping. We also have some wholesale customers wanting more bikes to order but we cant meet the demand due to not having enough bikes for our direct customers and wholesale. We also don’t have the warehouse space to order more but we are currently building our own warehouse so by next year this wont be an issue at all. We will have enough inventory to support the wholesale demand. S: What’s the best tool you use to stay organized with your Venom Motorsports? M: Shopify really helps us stay organized. My team consists of my brother, two cousins and myself, and so weekly meetings also help us all stay on track and stay organized with our most important tasks. Also, I really like the tried and tested to-do list. Anything you think of write it own and tackle it the next day or throughout the week! S: What core services or resources have you used to grow Venom Motorsports that you wholeheartedly recommend? M: Find influencers on YouTube and Instagram. Also Facebook! Facebook advertising is so powerful you reach a lot of people for such a little investment. Outside of these channels I’d also have to recommend the Scout App. It’s basically like a lead magnet which we call up and close over the phone. An example of Scout’s alert to Mostapha’s phone when a customer abandons checkout. S: Seeing that your products are large and expensive, I’d guess you would have many abandoned checkouts. When it comes to managing cart abandonments, how do you use Scout to engage directly with customers and recover revenue? M: Scout has helped us grow a lot! I say that because I sell expensive items, average shopping cart is $1,000 so customers don’t necessarily buy right away. So when Scout tells us that someone abandoned their cart it gives us a reason to call them right away. Turns out the reason they did not buy is because they had questions that were not answered on the site. And more often than not it leads to a sale just by giving them a call quickly while they are still “hot” and in the mood to buy. S: What kind of impact has recovering abandoned carts had on your overall revenue? Has it been a successful use of your business’ time and resources or is it something you could manage without? M: Our revenue has jumped almost 20% since using Scout! I don’t know how we’d recover carts without it. Like, yes, Shopify lets who know who abandons your cart but what Scout does is let you know instantly and right to your cell phone that I always have on me. Calling a customer right away gives you almost 99% chance of closing them on a sale then calling them 2–4hrs later or even the next day. I cant go a day without using Scout its used everyday and we close customers everyday because of it. S: What challenges have you faced shipping your products? 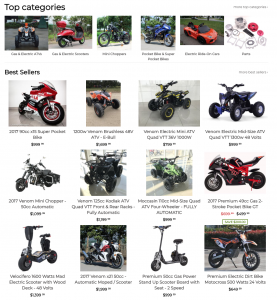 Your motorbikes are still pretty big and heavy compared to the average product bought online. Are there certain methods you use or practices you have to be cognizant of? What tools/apps/products do you use to help streamline your shipping strategy? M: Challenges were definitely dealing with damages! Our bikes are fragile and shipping companies don’t really care when handling your bikes. They drop them, throw them, or even just mistakes happen and they get damaged. How we fixed it was got much better packing from the factory in China as well as started to use LTL freight shipping companies that handle shipments on pallets/skids and moved from truck to truck with forklifts. A little more expensive to ship that way sometimes but bikes arrive in perfect shape, customers are happier, and we don’t deal with the headaches the damages come with. S: What’s your business’ biggest failure to date? M: Importing products that did not meet regulations and having them sent back to the manufacturer. Do you research before taking action because it can be costly sometimes. S: What advice would you give to other business owners when it comes to recovering their abandoned carts? M: Call them instantly and ask for feedback around why they didn’t end up buying. Was there something wrong with the site or did they have any questions and they will tell you. Most of the time they just needed answers and by you calling them it makes them have trust in you. I doubt the other brands selling motorbikes aren’t calling them, so your customer service also looks better. We also learned that sometimes people abandoned their cart from the price, so by calling them while they still have the item on their mind and giving them a discount that also leads to a sale! S: What’s your business’ biggest success to date? M: Taking advantage of Black Friday and Christmas. Expanding to wholesale was also good for business. S: What’s the best advice you’ve been given in regards to business? M: Be diligent with your daily to do list and tackle it everyday. S: What advice would you give to entrepreneurs just starting their first business? M: Just start. Don’t overthink it. Start and it will all come together because what you thought your business was going to look like will be completely different once you actually get started and take off. S: What is the one thing you attribute the majority of your success to? This could be a strategy, a tactic, something that happened unexpectedly. What was the one thing that made the biggest impact for your business? M: Biggest success is honestly the way you work. Being an entrepreneur is hard because you don’t have a boss or manager watching you and telling you to work. You have to put in the work and if you don’t, then no work gets done. I actaully have to attribute going to university as the reason for how I work. Running an online store, the things that come with it, and to grow it is like being in school. You have all these little assignments that you have to tackle, projects, and content you have to produce that are exactly like being in school and school taught me a good work ethic and I use it everyday in my business.